The Arkansas Archeological Survey conducted excavations at Saltpeter Cave in Newton County in 1969 and 1970—the very early years of the organization. Ken Cole, the first Research Station Archeologist stationed at Arkansas Tech (then Arkansas Polytechnic College) conducted two seasons of excavation into this shelter that had been previously visited by Dellinger’s crews in 1934. Cole excavated nine test units, the deepest of which contained almost 14 feet (4.11 meters) of archeological deposits representing at least 9,000 years of Arkansas history. This deep, stratified deposit is all the more important to researchers as it is one of the few deep Arkansas bluff shelters investigated using modern excavation techniques. Thus, unlike the materials from the Dellinger excavations of the 1930s, we have detailed stratigraphic records, along with approximately 450 diagnostic hafted bifaces, and 42 un-dated radiocarbon samples. Unfortunately, Cole left the Arkansas Archeological Survey shortly following these excavations, leaving this collection curated, but largely untouched for 47 years. Jared Pebworth and Lydia Rees photograph diagnostic bifaces from Saltpeter cave. Jared Pebworth and Lydia Rees have begun to photograph the diagnostic lithic tools just focusing on the deepest unit—Test Unit E. If you just flick through the photographs by level of these hafted bifaces you can literally see some of the type transitions we are going to be able to explore with this collection. Over the course of the next year, we hope use the Salt Peter collection to address some questions about Ozark chronology—particularly of the Early and Middle Archaic periods. This is much needed as many of these points types are, to this day, dated by a single, or relatively few, radiometric dates. The deep, stratified deposits at Salt peter Cave offer us an opportunity to analyze a cross-section of Ozark prehistory. 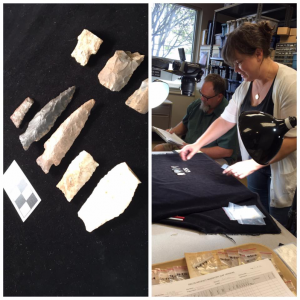 We received a start on our efforts to date this remarkable collection in the form of a grant from the Archeological Research Fund of the Arkansas Archeological Society. This will allow us to pay for one radiocarbon date associated with a projectile point from test unit E from the Saltpeter site. We will keep you posted on what we find out. We will also keep looking for additional funding to run more dates from this site.